Plug A Beautiful Mind back into the historical biopic generator with The King's Speech and you get The Theory of Everything, the story of legendary theoretical physicist Stephen Hawking. But while it is by no means a fresh take on the genre—it's the same tale of human exceptionality we've already heard numerous times this year alone—the performances from its cast give it a charm and vitality which helps it stand apart (slightly) from the crowd. This time of year it's easy to be cynical and cry Oscar-bait at every opportunity, but The Theory of Everything manages to be heartwarming in spite of its derivative "prestige product" storytelling. Of the big British biopics coming out this year, this is the one I was looking forward to least, and yet it turned out to be my favorite. The trailers all make it look overbearingly manipulative by dwelling on the hardships placed on Hawking, but instead of focusing on these artificial, external barriers, the film itself is much more concerned with his internal emotional life. Eddie Redmayne is instantly lovable in the central role, and he imbues Hawking with a mischievous quality that brings him down to earth and makes him immediately accessible. Redmayne is the heart of the film, and he makes what could have been a gimmicky performance into something more (his face in particular is amazingly expressive). The film is also a visual delight, although a slightly inconsistent one. Half of it is presented realistically but without much style, while the other half adds melodramatic flair through lighting and editing. For example (album), compare these two shots, which have no real distinguishing characteristics beyond maybe "green for exteriors" and "brown for interiors," with this shot which is so blue it looks like it could have come from a romantic fantasy, or this shot-reverse-shot, a wide angle close up which is so burned out it looks like it belongs in a Terry Gilliam movie. There are also cuts which jump dramatically from a cold blue to a warm red and vice versa which perfectly stage scenes without the need for expository dialogue (as a result, some of the best moments are the wonderfully evocative montages). Of course, while these moments are artistic and powerful and properly cinematic, this occasional visual poetry makes the rest of the film that much more disappointing by contrast. There's an overabundance of foreshadowing which ranges from clumsy to tasteless (Hawking's roommate remarks, "This is going to hospitalize me!" in response to a particularly difficult school assignment). While it's not as much of a blunt tearjerker as it could have been, it almost goes too far in the opposite direction, mechanically checking off important life events. The screenplay peeks its head up through the surface of the film, making crucial turning points feels forced or artificial (a family member pops in to tell Mrs. Hawking to join the choir and then disappears, never to be seen or heard from again). But the biggest problem is that it never successfully develops any of its own themes. Hawking's is a story about facing your mortality and about the split between mind and body ("Your thoughts won't change, it's just no one will know what they are"), but after this discussion is set up in the first act, the rest of the film is content to glide along on the surface of these issues. There are a variety of attempts at creating thematic centerpieces, but these moments aren't integrated into the rest of the film. The story tries to be about hope ("Where there is life, there is hope") and happiness ("I'm trying to work out the mathematical probability of happiness") and nostalgia ("Wind back the clock"), and by spreading itself so thin it fails to achieve any depth. It looks nice and has some well-staged scenes, but there's very little beneath the surface. It tries to make its own theory of everything, and unfortunately it comes up short. 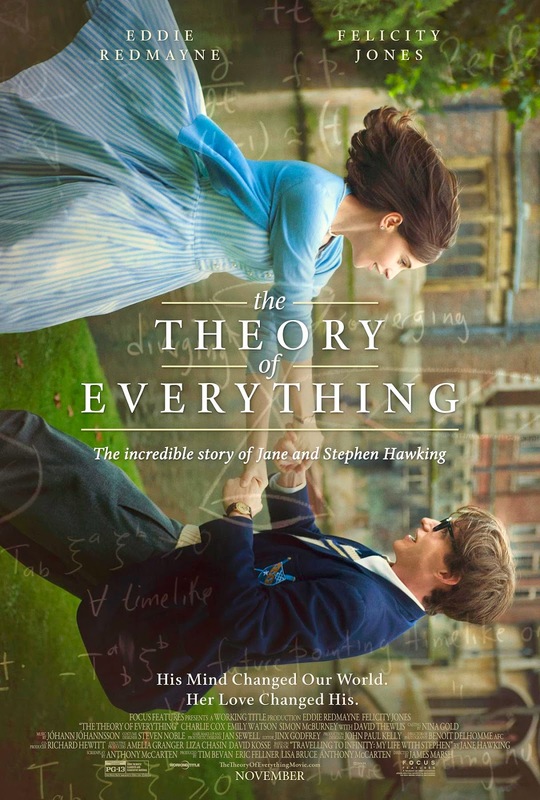 It would be easy to dismiss The Theory of Everything as just another by-the-numbers biopic romance, but while this is essentially the case, there's enough going on to redeem it from its position as a calculated attempt to win some awards. Even if it doesn't live up to the praise heaped on it by Oscar voters, between the actors and the visuals there's enough going on to make it an enjoyable experience.